"Mexican night is made easy with these simple enchiladas that are ready in just 30 minutes. Mexican-style tomato soup, cooked chicken and Colby Jack cheese combine to make a scrumptious filling for warm flour tortillas. 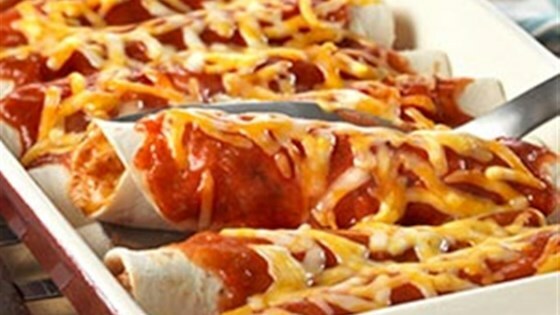 Baked until hot and bubbling, these cheesy chicken enchiladas are sure to earn rave reviews." Heat the oven to 350 degrees F. Stir 1/2 cup soup, the chicken and 1/2 cup cheese in a medium bowl. Spoon about 1/4 cup chicken mixture down the center of each tortilla. Roll up the tortillas around the filling and place seam-side down into an 11x8x2-inch baking dish. Pour the remaining soup over the tortillas. Cover the baking dish. Bake for 25 minutes or until the enchiladas are hot and bubbling. Top with the remaining cheese. Sprinkle with the cilantro, if desired. My husband went crazy over this recipe :) He is already asking me to make it again! So easy and quick! I made it with cream of chicken soup. I will definitely make this again.